An old school or 1890 era Barbershop Quartet complete with Vests, Arm Garters, Straw Hats and Spats. Our lively banter will have you rolling in the aisles. We are the Barbershop Harmony Society's Far Western District Champions and have won the Standing Ovation Award the last two years in a row. We can entertain you for 20 minutes or 45 minutes, and anything in between. We have received the following accolades: "Wonderfully entertaining," "so professional," "great voices," "you were the highlight of our luncheon." Not only are we uniquely musical, but we are a complete entertainment package. We will make your event most memorable. You will hire us back again and again. The show was excellent, and I will hire them again. Thank you, Mario, for your five-star rating. It was our pleasure to perform at your party. And thank you for the generous tip you sent. By the way, we are rehearsing "Take Me Out to the Ball Game." We plan to have it in our repertoire very soon. David Livingston for the Velvet Frogs. I recently booked Velvet Frogs for a surprise birthday present for my friend. They showed up ready to go and put on a fantastic show! A real class act. Everyone in attendance was enamored with their harmonies. Looking forward to booking them again. The Velvet Frogs made me grandma’s birthday extra special Our whole group enjoyed their humor and excellent voices. The event wouldn’t have been the same without them! The Velvet Frogs blend harmony and comedy into an unforgettable experience. They sound amazing and everyone at the party absolutely loved them. They showed up early. Were great singers, had funny jokes, and involved the audience in there performance. The Velvet Frogs Had Us Swooning! 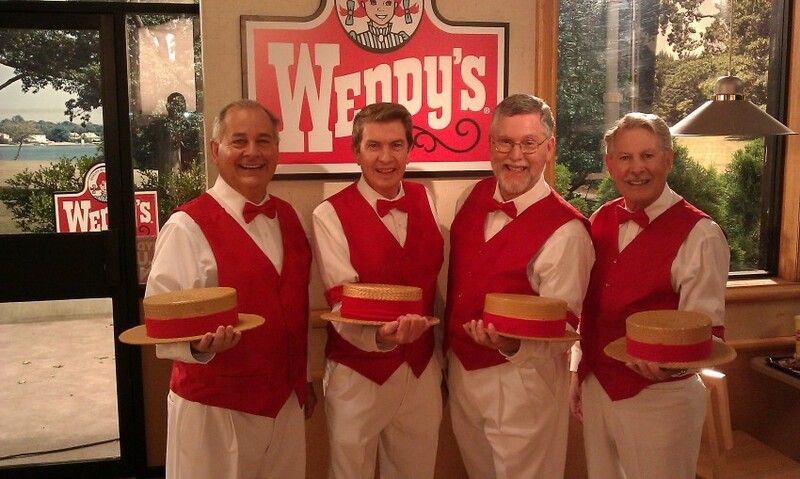 We booked the Velvet Frogs as a Barbershop Quartet for a video production project and they were amazing! Their vocals were perfect and their harmonies had all the ladies swooning! They were friendly, professional, and very accommodating. I'm so grateful that they were a part of our project and I'd highly recommend them to anyone! The Velvet Frogs is a polished entertainment group that had the Mr. San Antonio Gardens Retirement Community applauding for an encore. They hit that golden harmonizing note perfectly and often, even coming down into the audience for that personal touch on occasion. I recommend this quartet for any age group that appreciates the genre of the "turn of the (19th) century" music. It's non-stop. Velvet Frogs were guest talent on our annual barbershop show. We use comment cards and they were listed as the favorite on most of the cards. Song & dance men with wholesome humor. Also interacted with our chorus and were awesome at the afterglow (cast party). Would be a joyful addition to any variety show, private party, or other event. A complete entertainment "package" indeed! These immensely talented and extremely humorous "frogs" were the absolute hit at our father's 90th birthday celebration last weekend. Our father is still saying what a great quartet they are, which attests to the fullness and richness of their sound. While they were performing, smiles were on everyone's faces, and at times tears were visible because of the beauty of their harmonies and/or because of the almost non-stop humor between songs. My siblings and I are not going to wait for our 90th birthdays to ask these gentlemen to come entertain us again. They are solid! What a treat. We wear the traditional Red Vest, Arm Garters, Bow Tie, Spats and Straw Hat most of the time. However, for a wedding, our Black Suits are more appropriate. We actually have several costumes including an old suit that Sam made for us. The only problem is that the pants are too long! We'll sing about it for you. We often sing Happy Birthday combining with it our favorite of "You Can't Do The Things You Used To Do, 35 Years Ago". Always a crowd favorite. Between songs the Frogs love to share corny song titles and yes we have lots. Like, "I Took My Girl To The Corn Field And Kissed Her Between The Ears" or "What Will You Do With The Butter Mother When The Rolls Are Called Up Yonder?" We have fun and make certain that everyone else does too. 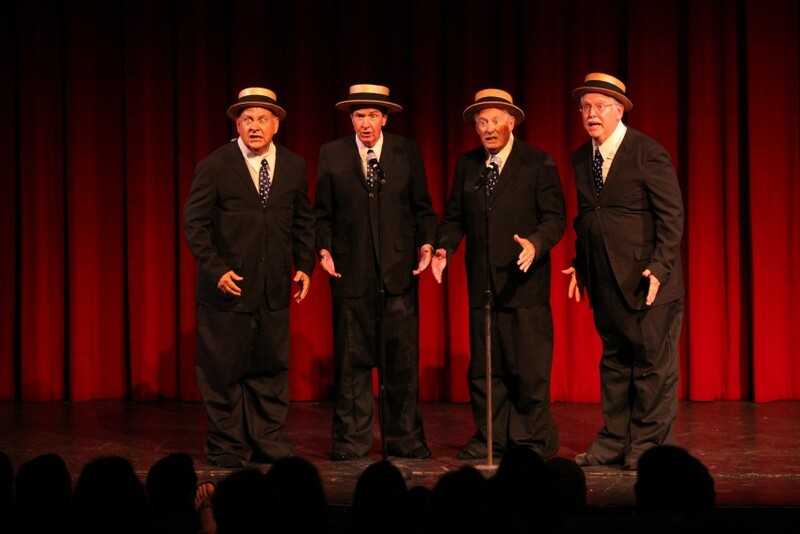 The Velvet Frogs have been together for 7 years but individually have been singing Barbershop harmony since the early 1960's and & '70's! 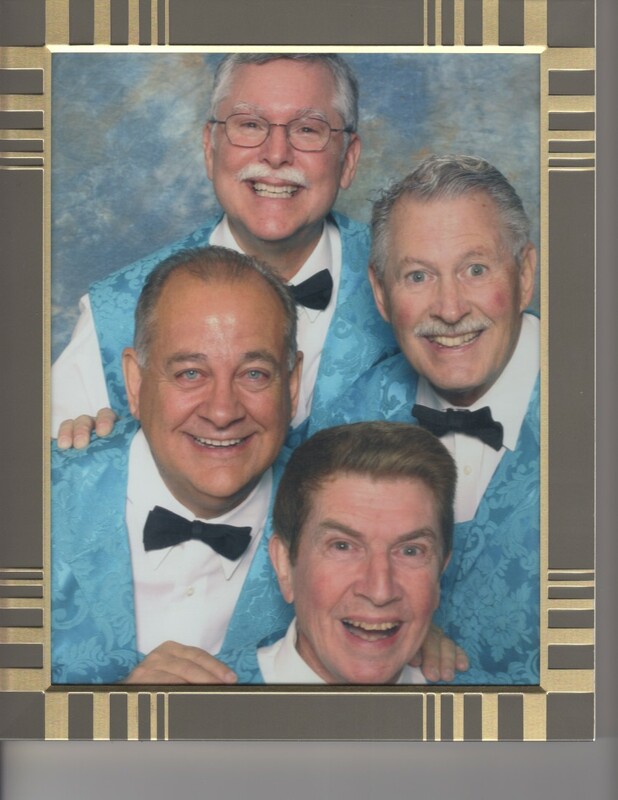 3 of the 4 of us are 2nd generation Quartet singers as our Dads were all members of the Barbershop Harmony Society although at that time it was known as the S.P.E.B.S.Q.S.A. Anyway, we specialize in the old songs that were popular from1890 thru 1930. 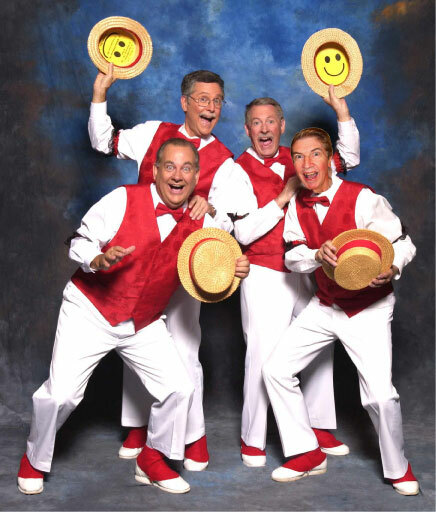 We know the art form of Barbershop Quartet singing and would love to entertain at your party. The great part about the Frogs is that we need nothing as we sing a cappella. We stopped bringing our piano as it was to hard to get on the airplane. And unless it is a large auditorium or special outside venue we do not require amplification. We did have a mic when performing at the Hollywood Bowl. 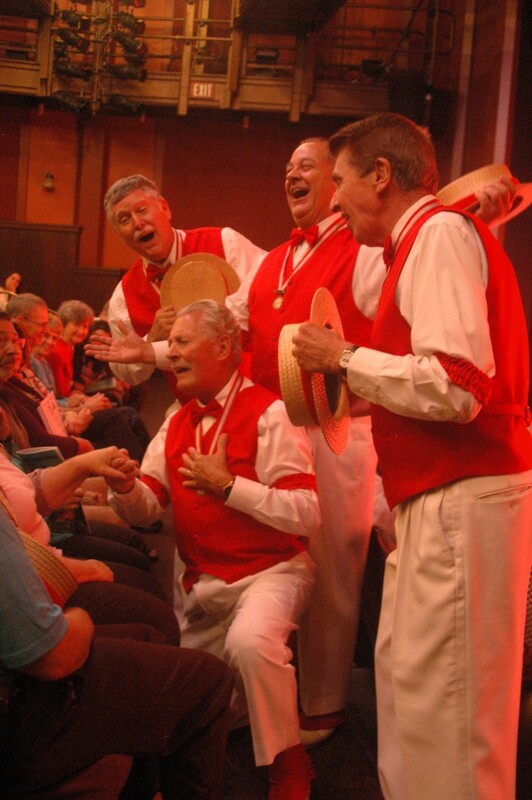 And the next day in the newspaper the revue read....."The Barbershop Quartet was Slick and Corny". That is us, Slick and Corny. None. We usually run down and sing in the audience.